This super slim Rosewood Herb Grinder is fashioned from aged & cured plantation-grown rosewood, stainless steel pins, and magnets to hold it together. Offers an excellent ergonomic designed and is designed for the long haul. Guaranteed not to warp with regular use. All 1905 grinders are precision made by high tech machines instead of underpaid workers in developing countries. You can easily see the difference in quality. Includes drawstring stash bag. 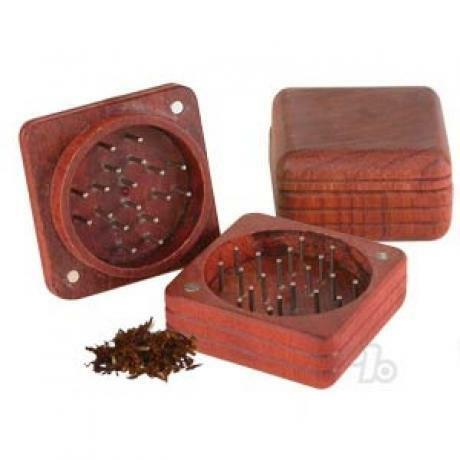 Well, more of a "shredder" than a true grinder, resulting in a coarser herb. I like how clean the tines stay after continued use compared to a traditional grinder design. In hindsight I might have gone with one of the other two styles of this product so there's more to hold onto when grinding the herb. Right price right grind love the wood! I really like the rosewood grinder, it does the job well, and it cost much less than aluminum with sharp teeth. Looks very nice, overall quality is good. If putting in nugs without much break up before hand, can be a little tough to grind up and will occasionally have some resistance. Do it enough and it works though. Very elegant grinder. Matches my Jack Herer pipe (sort of).